Standing Male Figure, about 800 B.C. Many of the practices and beliefs found throughout the ancient Mesoamerican cultures were initiated by the Olmec, who lived in the swampy lowlands of Veracruz. The first to evolve from simple village communities into a hierarchical society, the Olmec were governed by rulers with claims to divine authority. By the first millennium B.C. they had constructed large public ceremonial centers of massive architecture and displays of colossal sculptures. 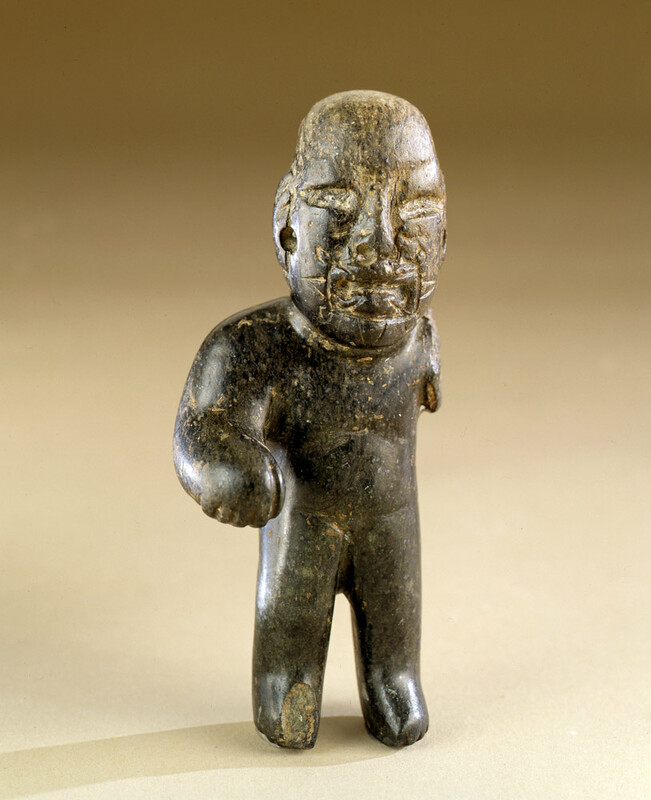 Jade and similar green stones were among the most coveted commodities within the Olmec's extensive trade network. Valued for its rarity and beauty, green stone was often used to sculpt figurines for burial caches, such as the present example. This carved piece is a crude rendition of the man-jaguar, a figure whose meaning remains a mystery. While its down turned mouth and slanted eyes are typical features, the incised lines at the side of the mouth are unusual.